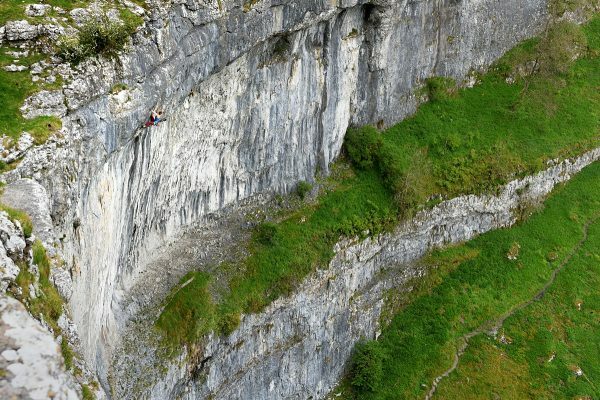 Privileged to have a bird-eye view last week whilst photographing Mina Leslie-Wujastyk send Totally Free II (F8b) at Malham. It was pretty inspiring stuff from Mina – as usual! At 70m in length it’s one of the longest single pitch hard sport routes in the UK. Mina tied in at 4pm on Wednesday 9th. An hour later, she had topped the final roof and only two metres or so of climbing remained; a nasty, rounded mantleshelf onto the final, final headwall. Having belayed Mina on the first half of The Groove, I handed over the belay duty to ‘Buster’ Martin and then ran round to the top of The Cove with my camera. I arrived to see Mina climbing Free and Easy – perhaps the second most ‘out-there’ F7c in the UK. At the top of that she faced the final roof of Breach of the Peace – a huge roof right at the top of The Cove another F7c pitch and definitely totally ‘out-there’. Finally she committed to the final roof. Determined as ever, Mina was soon on the very lip but it was almost immediately obvious that she’d hit a problem. She could just about reach the final quickdraw above and off to one side of her but the rope drag was so bad she couldn’t pull any slack through and clip it. Then the forecast rain started; initially a few spots being blown in on an increasing wind. She hung there for fully ten minutes shaking out and trying to clip the draw as it swung about in the wind. Cramping badly and in the face of increasing rain she gritted her teeth and committed to the mantleshelf finish. Pulling over the final bulge she drew level with the quickdraw – still stubbornly off to one side. Her movement were determined but her elbows were up. One final last-ditch throw to a distant hold failed; totally blown she fell off the final roof into the wind, the rain and the abyss! Two metres off a 70m route after 70 minutes climbing was no place to fall! Two days later Mina was back. Battle-scarred and still pretty tired but with a new game-plan. Her first burn she fell off the top of The Groove. A weaker person might have thrown the towel in – but not Mina! 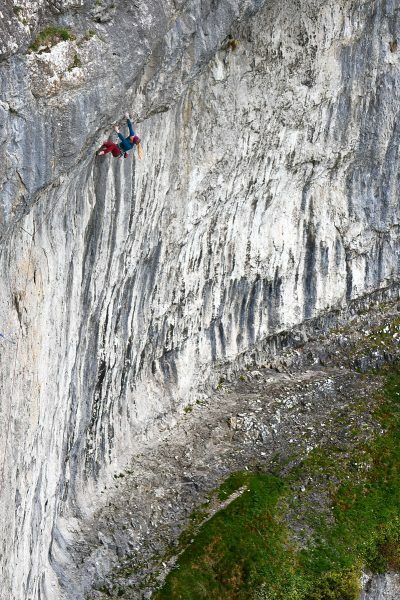 “It’s always worth one more go though” she said before tying in again for what turned out to be a successful ascent, the first by a women of one of the longest and best single-pitch hard sport route in the UK. This entry was posted in Climbing, Photography.